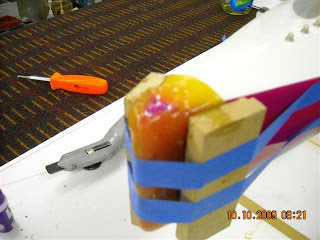 Bow bumper stuck in the mold. 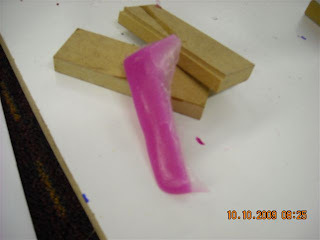 Untrimmed bow bumber out of the mold. Bow bumper attached to the boat. I went by the boat yard this morning and checked on the silicon bow bumper made yesterday. 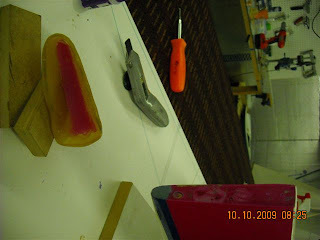 It had set up and as i tried to pull the mold off the boat, the bumper came off inside the mold. 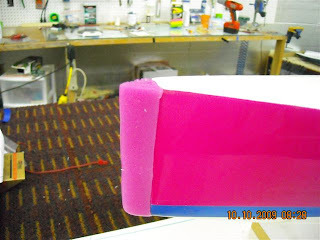 I pulled the mold off, cleaned up the edges and then mixed up a small amount of the A & B silicon material to smear on the both the stem of the boat and on the bumper itself. I then attached the bumper to the boat and taped it in place. I hope this will hold the bumper securely to the boat. 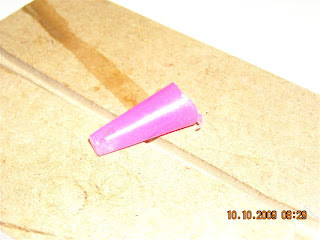 I also made a drain plug from the pink silicon stuff and this pulled out of its mold pretty good, as you can see from the photos.